Harry Potter and the Chamber of Secrets is a 2002 fantasy film directed by Chris Columbus and distributed by Warner Bros. Pictures. It is based on J. K. Rowling's 1998 novel of the same name. The film is a sequel to the 2001 film Harry Potter and the Philosopher's Stone and the second instalment in the Harry Potter film series. It was written by Steve Kloves and produced by David Heyman. Its story follows Harry Potter's second year at Hogwarts School of Witchcraft and Wizardry as the Heir of Salazar Slytherin opens the Chamber of Secrets, unleashing a monster that petrifies the school's denizens. The film stars Daniel Radcliffe as Harry Potter, with Rupert Grint as Ron Weasley, and Emma Watson as Hermione Granger and is also the last film to feature Richard Harris as Professor Albus Dumbledore, due to his death that same year. The film was released in theatres in the United Kingdom and the United States on 15 November 2002. It became a critical and commercial success, grossing $879 million at the box office worldwide. It was the second highest-grossing film of 2002 behind The Lord of the Rings: The Two Towers. The movie was nominated for many awards including the BAFTA Award for Best Production Design, Best Sound, and Best Special Visual Effects. It was followed by six sequels, beginning with Harry Potter and the Prisoner of Azkaban in 2004 and ending with Harry Potter and the Deathly Hallows – Part 2 in 2011, nearly ten years after the first film's release. Harry Potter spends the summer with The Dursleys without receiving letters from his Hogwarts friends. In his room, Harry meets Dobby, a house-elf who warns him of a peril that will take shape if he returns to Hogwarts. Dobby reveals that he intercepted his friends' letters, and destroys a cake in order to prevent his return to school. The Dursleys lock Harry up, but Ron Weasley and his older twin brothers, Fred and George, rescue him in their father's flying car. While purchasing school supplies, Harry and the Weasley family encounter Rubeus Hagrid and Hermione Granger. They attend a book-signing by celebrity wizard Gilderoy Lockhart, who announces that he will be the new Defence Against the Dark Arts teacher. During a small confrontation with Draco Malfoy, Harry meets Malfoy's father, Lucius, who discreetly slips a book into Ginny Weasley's belongings, which only Harry sees, but he mentions this to no one. When Harry and Ron are blocked from entering Platform Nine and Three-Quarters, they fly to Hogwarts in the flying car. They crash into the Whomping Willow upon arrival, and Ron's wand is broken. Both boys narrowly avoid expulsion when Professor McGonagall gives them detention. During the detention, Harry hears strange voices and later finds caretaker Argus Filch's cat, Mrs. Norris, petrified, along with a message written in blood announcing the "Chamber of Secrets has been opened". McGonagall explains that one of Hogwarts' founders, Salazar Slytherin, supposedly constructed a secret Chamber. He placed a monster inside that only his Heir can control, capable of purging the school of muggle-born wizards and witches. Harry and Ron suspect Malfoy as the Heir, so Hermione suggests they question him while disguised using polyjuice potion. They utilise a disused bathroom haunted by a ghost, Moaning Myrtle, as their makeshift laboratory to brew the potion. When Harry communicates with a snake, the school believes he is the Heir. On Christmas Day, Harry and Ron learn that Malfoy is not the Heir, but he mentions that a muggle-born girl died when the Chamber was last opened fifty years ago. Harry finds an enchanted diary owned by former Hogwarts student Tom Riddle, which contains a flashback fifty years prior where Riddle accused Hagrid, then a student, of opening the Chamber. When the diary is stolen and Hermione is petrified, Harry and Ron question Hagrid. Professor Dumbledore, Cornelius Fudge, and Lucius come to take Hagrid to Azkaban, but he discreetly tells the boys to "follow the spiders". In the Forbidden Forest, Harry and Ron meet Hagrid's giant pet spider, Aragog, who reveals Hagrid's innocence and provides them a small clue about the Chamber's monster. A book page in Hermione's hand identifies the monster as a basilisk, a giant serpent that instantly kills those that make direct eye contact with it; the petrified victims only saw it indirectly. The school staff learn that Ginny was taken into the Chamber, and convince Lockhart to save her. Harry and Ron find Lockhart, exposed as a fraud, planning to flee; knowing Myrtle was the girl the Basilisk killed, they take him to the bathroom and find the Chamber's entrance. Once inside, Lockhart uses Ron's broken wand against them, but it backfires, wipes his memory, and causes a cave-in. Harry enters the Chamber alone and finds Ginny unconscious, guarded by Riddle. Riddle reveals that he used the diary to manipulate Ginny and reopen the Chamber. When Riddle creates the anagram for his future new identity, "I am Lord Voldemort", Harry realises that Riddle himself is Slytherin's heir and Voldemort's true identity. After Harry expresses support for Dumbledore, Fawkes flies in with the Sorting Hat, causing Riddle to summon the Basilisk. Fawkes blinds the Basilisk, allowing Harry to look at it directly without being killed or petrified. The Sorting Hat eventually produces the Sword of Gryffindor, with which Harry battles and slays the Basilisk, though he is injured by one of its fangs. Harry defeats Riddle and revives Ginny by stabbing the diary with a basilisk fang. Fawkes's tears heal him, and he returns to Hogwarts with his friends and a baffled Lockhart. Dumbledore praises them and orders Hagrid's release. Dumbledore shows Harry the sword he wielded was Godric Gryffindor's own sword, and says he is different from Voldemort because he chose Gryffindor instead of Slytherin. Harry accuses Lucius, Dobby's master, of planting the diary in Ginny's cauldron, and tricks him into freeing Dobby. The Basilisk's victims are healed, Hermione reunites with Harry and Ron, and Hagrid is released from Azkaban. In a post-credits scene, Lockhart is seen in a straitjacket, having published a new book: Who Am I?. Daniel Radcliffe as Harry Potter, a 12-year-old British wizard famous for surviving his parents' murder at the hands of the evil wizard Lord Voldemort as an infant, who now enters his second year at Hogwarts School of Witchcraft and Wizardry. Rupert Grint as Ron Weasley, Harry's best male friend at Hogwarts and a younger member of the Weasley wizarding family. Emma Watson as Hermione Granger, Harry's precocious Muggle-born best friend. Kenneth Branagh as Gilderoy Lockhart, a celebrity author and the new Defence Against the Dark Arts teacher at Hogwarts. Hugh Grant is said to have been the first choice for the role but due to reported scheduling conflicts he was unable to play the character. On 25 October 2001, Branagh was selected as Grant's replacement. John Cleese as Nearly Headless Nick, the ghost patron of Gryffindor House. Robbie Coltrane as Rubeus Hagrid, the half-giant gamekeeper at Hogwarts. Martin Bayfield portrays a young Hagrid. Richard Griffiths as Vernon Dursley, Harry's abusive Muggle (non-magical) uncle, who despises wizards and now works as a drill company director. Richard Harris as Albus Dumbledore, Headmaster of Hogwarts and one of the greatest wizards of the age. Harris died shortly before the film was released. Tom Felton as Draco Malfoy, Lucius' son. Jason Isaacs as Lucius Malfoy, Draco's father and a former Hogwarts pupil of Slytherin House who now works as a school governor at Hogwarts. Alan Rickman as Severus Snape, the Potions teacher at Hogwarts and head of Slytherin. Fiona Shaw as Petunia Dursley, Harry's Muggle aunt. Maggie Smith as Minerva McGonagall, the Transfiguration teacher at Hogwarts and head of Gryffindor. Julie Walters as Molly Weasley, the Weasley matriarch and a mother figure to Harry. Although Chris Columbus returned to direct, Frank Oz said in an interview with The A.V. Club that he was asked to direct this film but he had no interest in it. Production designer Stuart Craig returned for the sequel to design new elements previously not seen in the first film. These included the Burrow (the Weasleys' house), Dumbledore's office (which houses the Sorting Hat, The Sword of Gryffindor and Dumbledore's desk), Borgin and Burkes, and the Chamber of Secrets. Mr. Weasley's flying car was created from a 1962 Ford Anglia 105E. Principal photography for Chamber of Secrets began on 19 November 2001, just three days after the wide release of the first film. The first three weeks of shooting consisted mostly of second-unit work on special effects, primarily the flying car scene. First-unit photography then began in Surrey, England, at Number Four Privet Drive, Little Whinging, for scenes taking place at the Dursleys' home. Filming continued on location at the Isle of Man and in several places in Great Britain; Leavesden Film Studios in London made several scenes for Hogwarts. Other locations were shot in England, including a Hogwarts Express set in King's Cross railway station Platform 9¾. The famous cloisters of England's Gloucester Cathedral were used as the setting for Hogwarts School. Originally, a scene in which Lucius Malfoy is confronted in Dumbledore's office ended sooner but the final exchange was ad-libbed. Jason Isaacs felt his character would've said something after being humiliated, and Columbus asked him to try. According to Isaacs, he improvised, "Let us hope Mr. Potter will always be around to save the day." Isaacs was impressed by Daniel Radcliffe's maturation as an actor based on his own improvised line, "Don't worry. I will be." University of Cambridge linguistics professor Francis Nolan was hired to construct the Parseltongue language for the scenes where Harry Potter was talking to snakes. Principal photography wrapped in the summer of 2002, while the film spent until early October in post-production. In a change of cinematography from the first instalment, director Chris Columbus opted to handheld cameras for Chamber of Secrets to allow more freedom in movement. Due to the events that take place in Harry Potter and the Chamber of Secrets, the film's sound effects were much more expansive than in the previous instalment. Sound designer and co-supervising sound editor Randy Thom returned for the sequel using Pro Tools to complete the job, which included initial conceptions done at Skywalker Sound in California and primary work done at Shepperton Studios in England. John Williams, who composed the previous film's score, returned to score Harry Potter and the Chamber of Secrets. Scoring the film proved to be a difficult task. Williams had just completed scoring Star Wars Episode II: Attack of the Clones and Minority Report when work was to begin on Catch Me If You Can. Because of this, William Ross was brought in to arrange themes from the Philosopher's Stone into the new material that Williams was composing whenever he had the chance. The soundtrack was released on 12 November 2002. Footage for the film began appearing online in the summer of 2002, with a teaser trailer debuting in cinemas with the release of Scooby-Doo. A video game based on the film was released in early November 2002 by Electronic Arts for several consoles, including GameCube, PlayStation 2, and Xbox. The film also continued the merchandising success set by its predecessor, with the reports of shortages on Lego's Chamber of Secrets tie-ins. The film premiered in the UK on 3 November 2002 and in the United States and Canada on 14 November 2002 before its wide release on 15 November, one year after the Philosopher's Stone. The film was originally released in the UK, US and Canada on 11 April 2003 on both VHS tape and in a two-disc special edition DVD digipack, which included extended and deleted scenes and interviews. On 11 December 2007, the film's Blu-ray version was released. An Ultimate Edition of the film was released on 8 December 2009, featuring new footage, TV spots, an extended version of the film with deleted scenes edited in, and a feature-length special Creating the World of Harry Potter Part 2: Characters. The film's extended version has a running time of about 174 minutes, which has previously been shown during certain television airings. The film broke multiple records upon its opening. In the US and Canada, the film opened to an $88.4 million opening weekend at 3,682 cinemas, the third largest opening at the time, behind Spider-Man and Harry Potter and the Philosopher's Stone. It was also No. 1 at the box office for two non-consecutive weekends. In the United Kingdom, the film broke all opening records that were previously held by Philosopher's Stone. It made £18.9 million during its opening including previews and £10.9 million excluding previews. It went on to make £54.8 million in the UK; at the time, the fifth biggest tally of all time in the region. The film made a total of $879 million worldwide, which made it the fifth highest-grossing film ever at the time. It was 2002's second highest-grossing film worldwide behind The Lord of the Rings: The Two Towers and the fourth highest-grossing film in the US and Canada that year with $262 million behind Spider-Man, The Lord of the Rings: The Two Towers, and Star Wars: Episode II – Attack of the Clones. However, it was the year's number one film at the non-American box office, making $617 million compared to The Two Towers' $584.5 million. On Rotten Tomatoes the film has an approval rating of 82% based on 234 reviews, with an average rating of 7.21/10. The site's critical consensus reads, "Though perhaps more enchanting for younger audiences, Chamber of Secrets is nevertheless both darker and livelier than its predecessor, expanding and improving upon the first film's universe." On Metacritic the film has a score of 63 out of 100, based on 35 critics, indicating "generally favorable reviews". Audiences polled by CinemaScore gave the film an average grade of "A+" on an A+ to F scale. It is the highest rated Harry Potter film at CinemaScore. 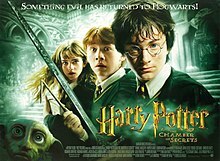 Roger Ebert called The Chamber of Secrets "a phenomenal film" and gave the film 4 out of 4 stars, especially praising the set design. Entertainment Weekly commended the film for being better and darker than its predecessor: "And among the things this Harry Potter does very well indeed is deepen the darker, more frightening atmosphere for audiences. This is as it should be: Harry's story is supposed to get darker". Richard Roeper praised the directing and the film's faithfulness to the book, saying: "Chris Columbus, the director, does a real wonderful job of being faithful to the story but also taking it into a cinematic era". Variety also said the film was excessively long, but praised it for being darker and more dramatic, saying that its confidence and intermittent flair to give it a life of its own apart from the books was something The Philosopher's Stone never achieved. A. O. Scott from The New York Times said: "instead of feeling stirred you may feel battered and worn down, but not, in the end, too terribly disappointed". Peter Travers from Rolling Stone condemned the film for being over-long and too faithful to the book: "Once again, director Chris Columbus takes a hat-in-hand approach to Rowling that stifles creativity and allows the film to drag on for nearly three hours". Kenneth Turan from the Los Angeles Times called the film a cliché which is "deja vu all over again, it's likely that whatever you thought of the first production – pro or con – you'll likely think of this one". The film was nominated for three BAFTA Awards. These were for Best Production Design, Sound, and Achievement in Visual Effects. The film was nominated for two awards at the inaugural Visual Effects Society Awards in the categories of "Best Character Animation in a Live Action Motion Picture" and "Best Compositing in a Motion Picture". The film was also nominated for six Saturn Awards in 2003 and in 2004 for its DVD release. ^ "HARRY POTTER AND THE CHAMBER OF SECRETS (2002)". AFI Catalog of Feature Films. Retrieved 24 July 2018. ^ "Harry Potter and the Chamber of Secrets (PG)". British Board of Film Classification. 22 October 2002. Retrieved 27 December 2015. ^ a b c d "Harry Potter and the Chamber of Secrets (2002)". Box Office Mojo. Retrieved 27 December 2015. ^ Reiter, Amy (1 October 2001). "Hugh can't always get what you want". Salon. Archived from the original on 13 October 2007. Retrieved 26 September 2007. ^ "Gilderoy Lockhart actor found for Potter 2". CBBC Newsround. Newsround. 25 October 2001. Retrieved 26 September 2007. ^ Rabin, Nathan (16 August 2007). "Frank Oz". The A.V. Club. Retrieved 10 August 2015. ^ "Harry Potter and the studio tour: Fans to go behind-the-scenes at Leavesden". Daily Mail. 22 August 2011. Retrieved 16 October 2012. ^ "Harry Potter's 'flying' car taken". BBC News. 28 October 2005. Retrieved 16 October 2012. ^ "'Harry Potter' making records disappear". USA Today. 18 November 2001. Retrieved 23 September 2012. ^ Kehr, Dave (23 November 2001). "At the Movies: Trading Britain For America". The New York Times. Retrieved 24 September 2012. ^ "Creating the World of Harry Potter, Part 2: Characters". A&E. ^ Burridge, Kate; Stebbins, Tonya N. (16 October 2015). "For the Love of Language: An Introduction to Linguistics". Cambridge University Press – via Google Books. ^ "Potter film should be finished next week". CBBC Newsround. 4 October 2002. Retrieved 16 October 2012. ^ Lawson, Terry (14 November 2002). "The second installment is charmed, director says". The Vindicator. p. D10. Retrieved 16 October 2012. ^ Jackson, Blair (1 January 2003). "The Chamber of Secrets". MIX. NewBay Media, LLC. Archived from the original on 12 October 2008. Retrieved 16 October 2012. ^ "Harry Potter and the Chamber of Secrets (John Williams/William Ross)". Filmtracks. 7 November 2002. Retrieved 23 September 2012. ^ "Potter trailer gets Scooby outing". BBC News. 13 June 2002. Retrieved 9 October 2012. ^ Krause, Staci (26 November 2002). "Harry Potter and the Chamber of Secrets: The second outting for the young wizard is better than the first...but how much better?". IGN. Retrieved 9 October 2012. ^ Cagle, Jess (3 November 2002). "When Harry Meets SCARY". Time. Retrieved 9 October 2012. ^ Kipnis, Jill (1 March 2003). "Blockbuster Sequels Ensure DVD's Sale Saga". Billboard. Retrieved 28 November 2010. ^ "Harry Potter and the Chamber of Secrets Blu-ray". Blu-ray.com. Retrieved 28 November 2010. ^ Calogne, Juan (18 September 2009). "Ultimate Editions Announced for First Two Harry Potter movies". Blu-ray.com. Retrieved 28 November 2010. ^ "Exclusive First Look at 'Harry Potter and the Goblet of Fire' to Be Presented During Network Television Debut of 'Harry Potter and the Chamber of Secrets,' Airing May 7 on ABC". Business Wire. 2 May 2005. Retrieved 9 October 2012. ^ Gray, Brandon (18 November 2002). "Harry Potter Potent with $88.4 Million Weekend". Box Office Mojo. Retrieved 22 September 2007. ^ "November 29-December 1, 2002 Weekend". Box Office Mojo. Retrieved 24 November 2013. ^ "Potter conjures up box office record". BBC News. 18 November 2002. Retrieved 22 September 2007. ^ "All time box office". Sky is Falling. Archived from the original on 1 September 2007. Retrieved 22 September 2007. ^ Strowbridge, C.S. (28 January 2003). "Chamber of Secrets sneaks pasts Jurassic Park". The Numbers. Retrieved 22 September 2007. ^ "2002 WORLDWIDE GROSSES". Box Office Mojo. Retrieved 22 September 2007. ^ "2002 Yearly Box Office Results - Box Office Mojo". boxofficemojo.com. ^ "OVERSEAS TOTAL YEARLY BOX OFFICE". Box Office Mojo. Retrieved 22 September 2007. ^ "Harry Potter and the Chamber of Secrets (2002)". Rotten Tomatoes. Retrieved 22 September 2007. ^ "Harry Potter and the Chamber of Secrets". Metacritic. Retrieved 22 September 2007. ^ Ebert, Roger (15 November 2002). "Harry Potter and the Chamber of Secrets". Chicago Sun-Times. Retrieved 22 September 2007. ^ Schwarzbaum, Lisa (13 November 2002). "Harry Potter and the Chamber of Secrets". Entertainment Weekly. Retrieved 22 September 2007. ^ Roeper, Robert (15 November 2002). "Harry Potter and the Chamber of Secrets". Ebert & Roeper. Archived from the original on 11 December 2002. Retrieved 22 September 2007. ^ McCarthy, Todd (15 November 2002). "Harry Potter and the Chamber of Secrets". Variety. Retrieved 22 September 2007. ^ Stevens, Dana (15 November 2002). "FILM REVIEW; An Older, Wiser Wizard, But Still That Crafty Lad". The New York Times. Retrieved 22 September 2007. ^ Travers, Peter (15 November 2002). "Harry Potter and the Chamber of Secrets". Rolling Stone. Retrieved 22 September 2007. ^ Turan, Kenneth (15 November 2002). "Harry Potter and the Chamber of Secrets". Los Angeles Times. Archived from the original on 11 October 2007. Retrieved 22 September 2007. ^ "BAFTA Nominees and Winners 2003 – The Pianist Tops the List". About.com. Retrieved 9 October 2012. ^ "1st Annual VES Awards". visual effects society. Retrieved 20 December 2017. ^ Moro, Eric (5 March 2003). "The 29th Annual Saturn Awards Nominations – Feature Film Category". Mania.com. Archived from the original on 18 October 2012. Retrieved 9 October 2012.